Curling Stones for Lego People: Troll Date with friends - Just a quiet meal... yeah right! Troll Date with friends - Just a quiet meal... yeah right! So whilst the trio of trollies went off to thrill the Jewellers in York and (eventually) see the sights... I was lounging on the sofa, planning out blog shots and sending photos off to those folk I knew wanted to see more of the Summer Stones Kit! 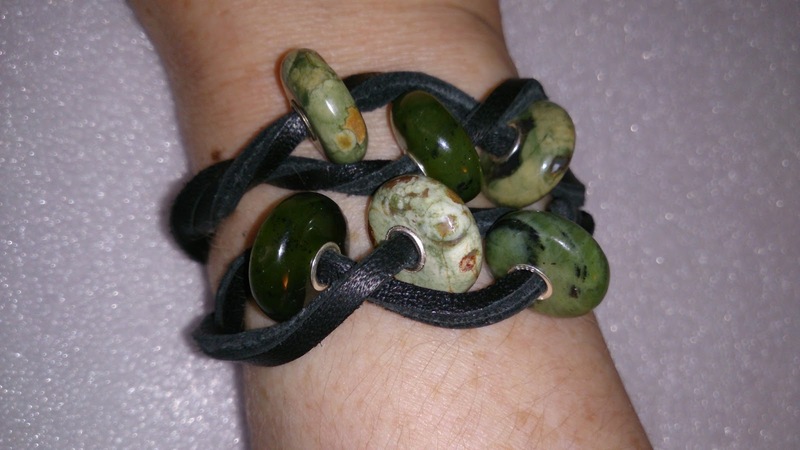 Black Leather bracelet with: Top Row - Rhyolite, Canadian Jade, Rhyolite. 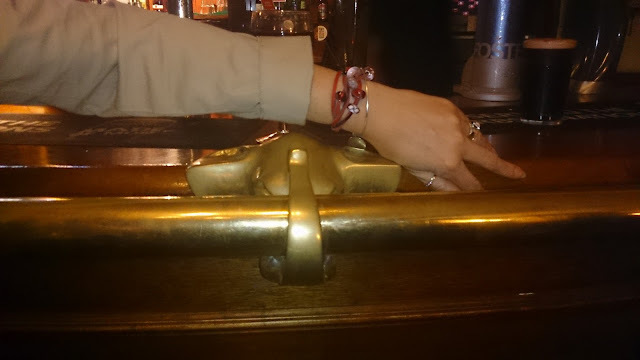 I love the bangle with 1 unique showcased in the middle of a leather twisted combination - it's my new look! 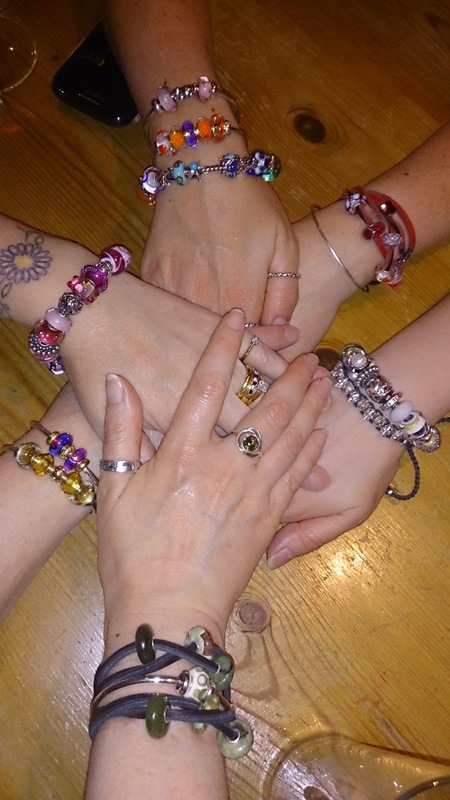 So the important things of the day done with my jewellery for the night chosen, photos taken, time to go meet the girls! I arrived at the restaurant and the first things to be sorted out were drinks and checking out each others new combos, I really like this group of trollies! Before we got down to the equally serious business of choosing food, I took a quick wrist shot. We were down by a couple of people for the meal due to unforeseen circumstances, so for those I didn't get a proper chance to meet or say hi/bye to, I hope to catch you next time! All I can say about the food was it was amazing, really, really stunning! Pauline was very taken with my Tuna Steak so I have a sneaking suspicion that I know what she'll be ordering next time she eats there! As our table was reserved for the night and it was bigger than we needed due to being down in numbers we settled in for the night. Indeed we were the last ones out as they were locking up! Not ones to call it an early night we retired to a nearby bar and Alison managed to spot another Elephant, she's definitely a Ninja Elephant Spotter! Once again there was much troll talk, as you'd expect, and many other subjects under the sun as we moved on to another bar (I think we were going to get a "crawl" in there somewhere) but although we had fun dancing it was a bit squished so we moved on again to somewhere that was still lively but with a bit more space! And finally the night had to end somewhere... I bid my goodnights, big hugs and a promise to keep in touch. For me the weekend was over and as I made my way home I reflected on what a truly superb weekend it had been. It wasn't quite the end of Pauline and Alison's weekend... those girls have stamina! I will tell you all about that, but maybe tomorrow... come back soon! And,I wasn't a lover of the stones, but they are definitely growing on me, LOVE the combo you wore that night! I would say I can't tell you how excited I am by the new release, but as you have been with me every step of the way... I actually can't tell you, as you already know! 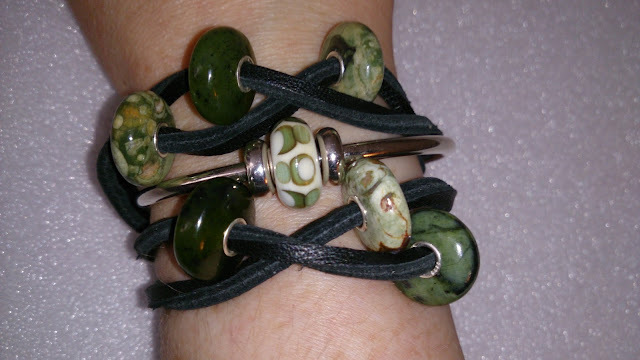 I love the variety in my Canadian Jades & Rhyolites and that unique was just made for this combo. That night I was so chuffed with the jewellery that as I caught sight of myself in a shop window on the way to the meal I was checking out my jewellery and not that my outfit was on straight!